it's about a talkative girlz. she was born on 29th Jan 1996 in Hospital Besar Alor Star, Kedah. she loves her parents n family damn much. heee and her name is shufa shareena. people often says that her name is weird. hahaha but she loves her name so much bcoz it is a combination of her parents name. lastly..,,ok xdak bnda dh nk ckp. hope that msuk f4 ni dh jdi matured skit eventhough i'm childish. 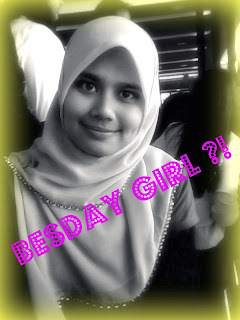 *aq tau muka aq huduh , x lawa , x cntik , x segak ..
kay, bye3.. going back to my hostel ..take care everyone . bye salam.